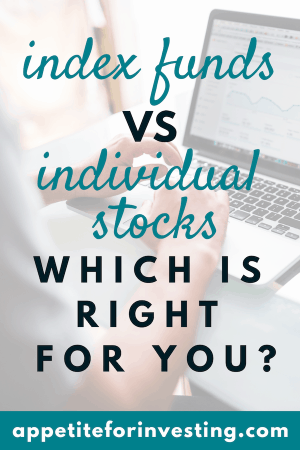 Index Funds vs Individual Stocks: Which is Right for You? There will always be an ongoing debate whether index funds or individual stocks are the best way to go about investing. On one side of the argument, index funds are better, because they give you the overall performance of the market, or whatever index it’s tracking. For instance one of the most popular ones, the S&P 500 index. Those in favor say it’s much better to invest in index funds because the cost is low to manage them, and you don’t have to do much work to get an “average” performance. In reality, it’s a better than average performance because 99% of actively managed US equity funds underperform. The index fund is really just a collection of stocks the index is tracking and more or less matches the performance exactly, less the fees of the fund. Typically you can find fees as low as .05% or even .01% in some cases. Those against the index fund go as far as to say passive investing is worse than Marxism. Yikes! But the thing is, it doesn’t really matter. It depends on your situation and what you’re comfortable with. There isn’t a right or wrong answer on what approach you take. Until there is no more room for growth in index funds, it’s still a solid option. If there was no more room for growth in index funds, this would mean 100% of assets from investors would be invested in index funds. However, apparently close to only about 20% of the combined value of all stocks are owned by index funds. This obviously means 80% is made up of active investors trying to beat the market. There’s more than enough room to invest in index funds, for the time being, so don’t let anyone tell you otherwise. Since 99% of mutual funds fail, just by getting an average performance of the S&P 500 makes in the top 1% of performers; Why would you need anything else?! Of course, this is from investors impulsively reacting to the day-to-day noise instead of thinking long-term, but would you be able to handle the lows? What is it? I have no idea! I just looked it up and it’s a royalty trust. Just because a dividend yield is better doesn’t mean it’s the right thing to invest in. Don’t be dumb, do your research before investing. Why sell when you can reap even greater benefits later and at the same time create less work on your taxes? Reading material can be the annual reports, understanding how to read a balance sheet, reading up on the competitors, seeing if the business is easy to follow, etc. From 2000-2003 the stock went from $1,737.20 to $1,040.77 and then after the financial crisis, all the way down to $5.86. In most situations, the average investor should look only to own the S&P 500 index fund, because it is usually the cheapest and gives you an average performance less inflation of about 7%. You have peace of mind knowing the average will play out, and you can sleep soundly knowing you won’t lose all of your money in a silly investment. What’s your opinion, do you prefer index funds or individual stocks? What research do you do beforehand?